Visiting professional groomers can be a luxury. Although we love spoiling our canine friends and they do deserve certain indulgences, regular visits to professional grooming studios can be quite expensive. By grooming your dog at home you can increase the period between two professional grooming treatments. Or if you get the hang of it, you can even skip going to salons and do everything at home. Remember that dogs of all breeds need regular grooming. 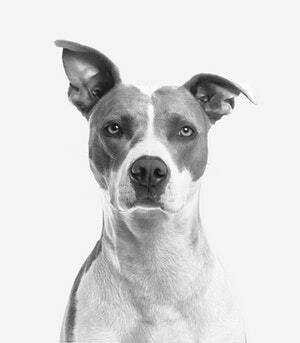 The only difference between different breeds is the time that needs to spent on grooming – from a few weeks to few months. The first rule when grooming your dog at home is accepting the fact that you need appropriate tools – dog grooming clippers, scissors, flea combs, shampoos. Last but not least, think about getting a dog grooming table. In this article we review the best dog grooming tables so you have a choice to go through a few and see which one fits you. 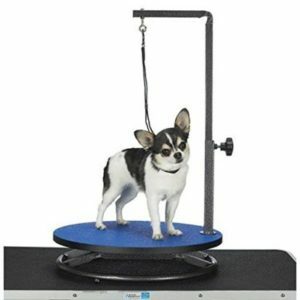 Placing your dog on a table makes it easier to restrain it and it is also easy on your back. For the professional groomers you want to work with commercial quality equipment that can stand the use of the table being used 8-10 times per day. You’ll want access to things as height adjustments so that you can work comfortably after grooming many dogs per day your back will thank you. Maybe you’re a mobile groomer portability can be important that you can take the grooming table with you from client to client. All these things matter and we’ll go through them below. Portable (folding) tables – as the name suggests, their legs can be folded, thus making the tables easily portable. Portable tables come in a variety of heights and table top sizes. Hydraulic tables – can be easily adapted depending on the dog’s and groomer’s heights. They also come in a variety of table top sizes. Electric tables – their concept is the same as in hydraulic tables, with the difference that instead of air hydraulics, electric tables use electricity for height adjustment. Electric tables are the most expensive choice. Budget – how much are you willing to invest. Practicality – it usually takes 1-2 grooming sessions for dog owners to realize that using benches, card tables and other grooming table substitutes does not work. They are not only tiring, but can also make you sore. Additionally the best dog grooming tables are time saving tools because they keep your dog in one place during the entire session. Security – when placed on an appropriate table, your dog will feel safer and more relaxed. Most grooming tables feature arms and loop attachments to keep the dog from walking off or jumping. The nonslip matting adds to the security. Comfort – it takes approximately an hour for a professional groomer to do their job. At home groomers definitely need more time. Professional grooming tables offer a higher level of comfort for both you and your dog during prolonged grooming sessions. Cleanliness – no matter how careful you are, grooming is a messy procedure. Using a grooming table makes it easier to clean up the mess after you are finished. To help you choose the best dog grooming table, we have compiled a list of 6 tables and reviewed each one of them. 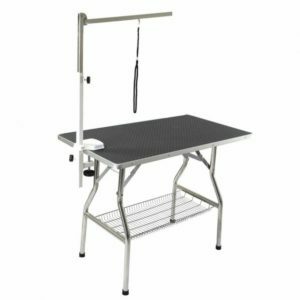 The Heavy Duty Stainless Steel Pet Grooming Table by Flying Pig Grooming is especially designed for professional grooming sessions. The frame is made of sturdy, rust resist stainless steel and it features non-skid feet that prevent the table from wobbling and sliding. The table top has a non-slip, bone-shaped and heavy textured, hard rubber covering. Because of its texture, the clipped hair sticks to the tabletop without scattering around. The covering is easy to clean. 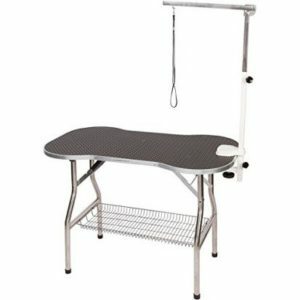 The Heavy Duty Stainless Steel Pet Grooming Table by Flying Pig Grooming has an adjustable and folding grooming arm with noose and loop. Additionally, the table features a storage basket. It is a foldable model, but the table is too heavy for regular changes of location. The Heavy Duty Stainless Steel Pet Grooming Table by Flying Pig Grooming is available in 3 different sizes – small (32’’ x 21’’), medium (38’’ x 22’’) and large (44’’ x 24’’); and in three different table top colors – black, orange and sky blue. The table is designed to hold weight up to 330 Ibs and comes with 1 year warranty period. The Heavy Duty Super-Low Electric Lift Dog Grooming Table by Flying Pig is a well designed, electric model that offers maximum comfort for both the user and the dog. It features an X-style frame designed for wider lifting range (from 10.45’’ in height to 41.5’’ in height, in less than a minute). Because of its wide lifting range, this table is good for older and heavier dogs that cannot jump high and cannot be easily picked up and placed on the table. 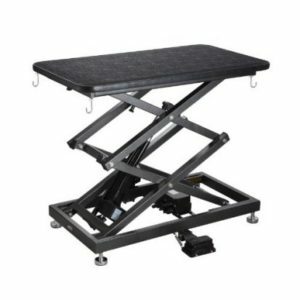 The heavy steel base and steel frame ensure durability. The removable, bone-patterned, silicone tabletop cover is easy to clean. Because of its texture the tabletop is slip-proof. The Heavy Duty Super-Low Electric Lift Dog Grooming Table by Flying Pig features convenient foot control pedals for height adjustment. The table also features leg levers for stable use on uneven floors; an adjustable, stainless steel overhead arm and grooming loops. Additionally, the table’s feet have wheels for easier portability. The Heavy Duty Super-Low Electric Lift Dog Grooming Table by Flying Pig is 45.80’’ long and 25.70’’ wide. The table is designed to support up to 220 Ibs and comes with a 1 year warranty period. The Super Durable Heavy Duty Foldable Grooming Table by Flying Pig is designed for both professional and home groomers. The table is sturdy enough to withstand heavy-duty use and light enough to be easily portable. Simply stated, this table is the ideal compromise between heavy-duty and minimal use. The frame is made of rust-resistant stainless steel. The rectangular tabletop is covered with non-slip, bone-textured rubber. The Super Durable Heavy Duty Foldable Grooming Table by Flying Pig features an adjustable and foldable grooming arm with noose and loop for maximum security. Additionally, the table has a spacious storage basket and anti-wobbling frame. The legs are foldable for easy storage. The Super Durable Heavy Duty Foldable Grooming Table by Flying Pig is available in three different sizes – small (32’’ x 21’’), medium (38’’ x 22’’) and large (44’’ x 24’’). The height of the table is up to 45’’ if including the arm. The table comes in three different tabletop cover colors – black, orange and sky blue. The table can support up to 330 Ibs. 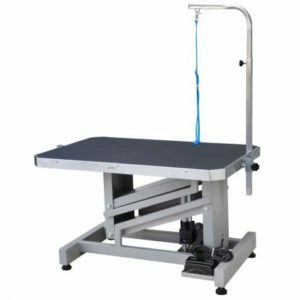 The Pet Grooming Table by Master Equipment is a well-designed table that offers maximum comfort when grooming small dogs. It is a professional-grade table that rotates to provide easier control over the styling process. The unique design of the table transforms any flat surface into a convenient grooming location. The table is made of durable tubular steel. The rounded tabletop has a non-slip and easy to clean surface. The rubber feet ensure stability and keep the table in place. 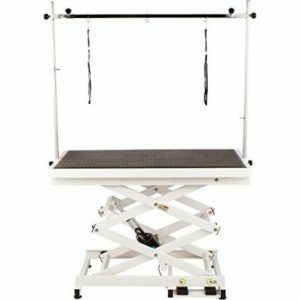 The Pet Grooming Table by Master Equipment features an adjustable, square-tube grooming arm that extends from 16 ¼‘’ to 23 ½‘’ and a coordinating-color grooming loop. The Pet Grooming Table by Master Equipment is 18’’ in diameter and comes in three different colors – black, blue and purple. The table can hold up to 110 Ibs. The Grooming Table with Electric Motor by Go Pet Club is perfectly designed for professional groomers. The electric motor lifts ensure easy and smooth height adjustments for extra convenience and flexibility. The tabletop is made of pebbled, non-slip plastic and rubber composite materials. The tabletop is lined with premium aluminum alloy to prevent absorption and warping of the lower wooden layers. The tabletop’s surface is static-free and easy to clean. The Grooming Table with Electric Motor by Go Pet Club features an extra safe Z-lift frame with an H-style base. The specially designed base and frame provide extra stability by eliminating unnecessary wobbling and tipping. Additionally, the table features an adjustable, clamp-on style grooming arm made of steel and a grooming leash. The Grooming Table with Electric Motor by Go Pet Club is 36’’ wide and 23.6’’ long. The table comes in only one color – black and can support up to 150 Ibs of weight. The Accordion Lift Electric Grooming Table by ComfortGroom offers the perfect combination of style and functionality. The frame is made of steel painted with scratch resistant paint. The removable non-skid, textured, pebble tabletop surface is waterproof and easy to clean. Additionally, the tabletop cover features a protective vinyl trim. The tabletop’s corners are rounded for extra safety. Each corner has a hook attached for handing shears and clippers. The Accordion Lift Electric Grooming Table by ComfortGroom features electricity powered height adjustment. The height adjustability is enhanced with a built-in, hands-free, foot remote that can slide out of view for better storage. The table’s height can be adjusted between 21.4-41.3’’. The Accordion Lift Electric Grooming Table by ComfortGroom is 42’’ long and 24’’ wide. The table comes in only one color – black and supports up to 320 Ibs of weight. The table comes with a lifetime warranty on the frame and 2 year warranty on the motor. All in all, it can be concluded that one of the most critical items for groomers (professional and at-home enthusiasts) is their grooming table. The word critical implies that the grooming table is a necessity rather than option. Therefore, when it comes to dog grooming tables, do not cut corners. Do a little online research and familiarize yourself with the types of dog grooming tables. Explore what feature each table offers and consider which of those features are important to you. Consider your dog’s size, the amount of grooming the table would be used for and whether you need to move the table around or it will be stationed at one place. After you have done your homework you will be prepared to make a facts-based decision. If still unclear about which table to choose, do not hesitate to talk to the salesperson at the pet saloon. It is also recommended to schedule an appointment with a professional dog groomer and have him explain to you which dog grooming table will serve your purposes best. Keep in mind that there is no universally good or bad grooming table. It all comes down to what you want and need.